Molnlycke Mepilex Border Lite Silicone Foam Wound Dressing from HealthyKin.com minimizes trauma to the wound and pain to the patient at dressing changes. The Safetac technology prevents Mepilex Border Lite from sticking to the wound bed yet adheres gently to the surrounding skin. Mepilex Border Lite is ideal for those locations where a thin self-adherent dressing is required. It is a very conformable and gentle alternative to other thin adhesive bordered dressings. This is the perfect bandage! My Mom has a non-healing wound from cancer surgery and this is the covering we use. It sticks well enough to stay on, but not so much that it "takes your skin" with it when it's removed. 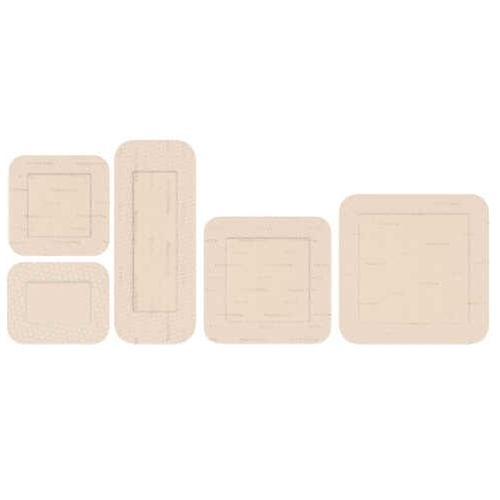 If you're looking for a secure and comfortable bandage; look no further! Outstanding dressing for slow to heal abrasions that afflict diabetics. This product is great. I develop skin allergies to almost everything. No problems with this. Comes off without injuring tender skin and keeps healing wound moist without maceration. Just way too expensive. HealthyKin has best price I have found online. Excellent for all wounds and pressure sores. Apply mepitel One to wound first. Also apply to back to prevent wound from occurring. All mepilex border lite products are great for my husbands wounds. Great for hard to heal areas. I use mepitel one on the wound first with antibiotic ointment. Wounds heal faster and are easier on the skin. I am using this product on a recurring pressure spot. This is the only bandage that doesn't cause a further problem. I won't use anything else. Cost and efficient shipping are a big plus. I have used these off and on since 2011, sometimes 10-12 months straight. There is nothing better that I am aware of for extended wear for long periods of time. I am so glad I bought these dressings. I used them on a chronic wound my 92 year old mother has. I bought them to help her with the discomfort of the wound. After 10 days the wound was almost gone. Amazing! This is the first time I used this product for a hard to heal area on my husband. It was an excellent solution to my problem. I have used other Mepilex border lite products for wound care for my husband and found HealthyKin.com prices more reasonable than other companies, especially when one has to treat 13 skin tears that he obtained while in the hospital.